After bringing you the Beer Bath in Czech Republic and the Chocolate Bath in Hanoke, Japan, a new type of bath will be added to the list. It’s the Noodle Bath, again in Hanoke, Japan. The Yunessan Spa House have launched a bath containing noodles and broth for their customers. Health authorities have banned edible noodles , so a synthetic noodle is used. A noodle bath is apparently good for the skin, and can increase metabolism. Posted: January 2nd, 2010 under Cultural, Entertainment. I have previously blogged about beer bath as the ultimate relaxation treat, but for non-alcoholics or chocolate lovers, these top it all. They are the latest craze in Valentine’s gifts: the chocolate spa in Israel and the chocolate bath in Hanoke, Japan. Posted: December 2nd, 2009 under Cultural, Entertainment. In Tokyo, Japan, this recital is the only one of its kind in the world, since most of the audience members… are asleep. In this two-day event called “Dolce Heavenly Concert”, spectators are invited to relax in luxury beds and since it’s sponsored by Haagen-Dazs, they are provided with as much ice cream as they can eat. Posted: November 16th, 2009 under Cultural, Entertainment. The Kayabukiya Tavern in Utsunomiya, Japan, employs two waiters with special background: they are both macaque monkeys. If you’re wondering how they are tipped, well they earn boiled soybeans as tips. Though in line with animal regulations, they only work for two hours a day. Posted: November 14th, 2009 under Cultural, Entertainment. In October 2007, the Japanese firm NTT DoCoMo unveiled a prototype “fitness phone”. Designed to help you stay fit, it has devices that measure burnt calories, heart rate, and even body fat. But most useful of all, the phone can tell you if you have a bad breath. An alcohol-breathalyzer is apparently due next. Posted: November 10th, 2009 under Entertainment, Technology. Fuamen, which is located in Nagoya, Japan, is the newest addition to the list of funky Japanese restaurants. Standing for ‘Fully Automated Ramen’, this restaurant prepares Ramen - which is a Japanese noodle dish - using robots! Launched by the robot manufacturer Aisei, the restaurant’s robot chefs even put the food into bowls and serve it. The entire process of making the noodles takes a minute and 40 seconds. In their downtime, the robots also spin plates and fight each other with kitchen implements. Posted: October 13th, 2009 under Cultural, Entertainment, Technology. Posted: September 1st, 2009 under Cultural, Entertainment. In Japan, the question “What is your blood type?” is a very informational question of utmost importance that people use it to know about the person’s characteristics and traits. According to Japanese beliefs, blood type is like Astrology to the West. It says a lot about the person’s personality, behavior, temperament, and compatibility with others. It is widely believed that more than 90 percent of Japanese know their blood type, and are often surprised when a non-Japanese does not know his/her. The characteristics of blood types are as follows. Type As are sensitive perfectionists but overanxious; Type Bs are cheerful but eccentric and selfish; Os are curious, generous but stubborn; and ABs are arty but mysterious and unpredictable. The blood type culture can be found in just everything in Japan. 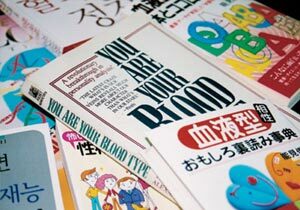 In 2008, four of Japan’s top 10 best-seller books were about how blood type determines personality, according to Japan’s largest book distributor, Tohan Co. The Prime Minister Taro Aso seem to consider it important enough to reveal his blood type in his official profile on the Web. Video games such as Street Fighter and Resident Evil series list character blood types in both the manual and in-game bios. Matchmaking agencies provide blood-type compatibility tests, and some companies use blood type information in interview to screen out candidates. Children at some kindergartens are divided up by blood type, and the women’s softball team that won gold at the Beijing Olympics used the theory to customize each player’s training. It doesn’t stop here. An industry has grown around this ideology, so that you can now buy blood type chewing gum, soft drinks, calendars and even blood type condoms! The condoms are all the same, but contain different instructions for each blood group on how to approach the sexual encounter! The idea is not backed up by Science. It all started in 1931 in Japan when Furukawa Takeji (1891–1940) proposed that there was a link between blood type and personality after working in the administration department of a high school and observing the temperamental differences between applicants. He published a paper entitled “The Study of Temperament Through Blood Type” about his observations in the scholarly journal Psychological Research. The idea was scrapped years later and the craze faded as its unscientific basis became evident. It resurfaced in the 1970s, however, as Masahiko Nomi, an advocate with no medical background, gave the theory mass appeal. His son, Toshitaka, now promotes it through a private group, the Human Science ABO Center. You can find more information about Blood Type Humanics at the Human Science ABO Center website. Posted: February 5th, 2009 under Cultural.